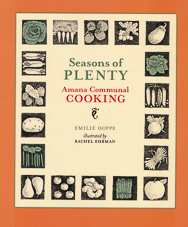 Seasons of Plenty provides colorful descriptions, folk stories, appealing photographs and illustrations of communal cooking in the Amana Colonies in Iowa. The book includes excerpts from journals and ledgers and recipes for good food such as savory dumpling soup, mashed potatoes with browned bread crumbs, Sauerbraten, and feather -ight apple fritters. Written by Emilie Hoppe and illustrated by Rachel Ehrman. From the Bur Oak Books Series.